What do I find comforting? I find the Fall very comforting, those cool crisp days. In Italy I haven’t experienced very many yet but the odd one slips in. Finally putting a comforter on the bed and throws on the couch and armchairs, lighting the fireplace, and candles, I love lit candles. And most of all comfy food. To tell the truth I find most Italian food comforting. But most of all to me there isn’t anything better to warm you up but a delicious, hot Bowl of Soup. Today I want to share with you my Favourite Bloggers and their 12 Comforting Bowls of Soup. Ahhh Black bean soup, I think I became a black bean lover when I went home to Toronto last year, I just couldn’t get enough, and this yummy soup that Erika has made, is not only full of black beans but lots of other fresh veggies. 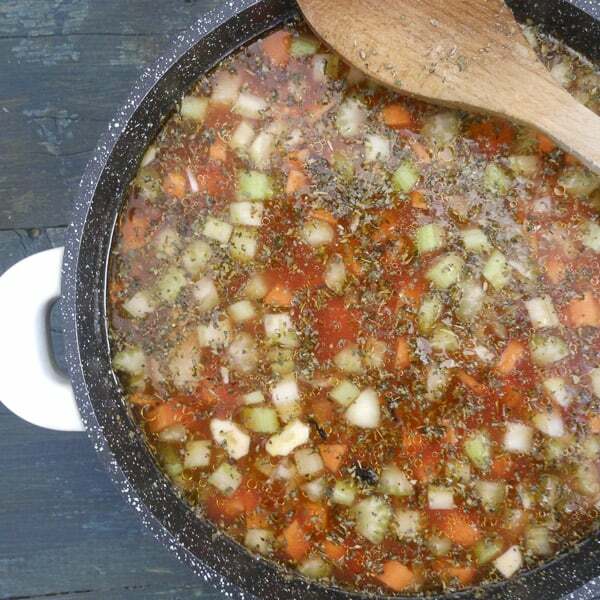 A definite winter must soup. 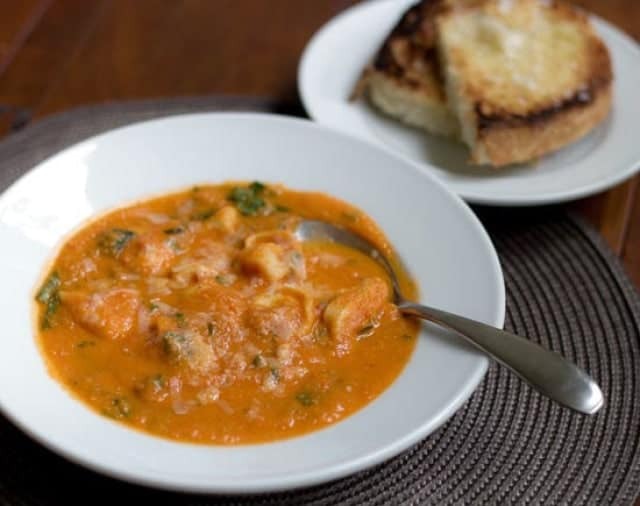 Tortellini is one of my favourite Italian stuffed pastas, and in a soup? Now that is comforting. Made with fresh ingredients (or use up that can of carrots that you don’t know what to do with)! As April says thick or thinner you decide. Either way this is more than a soup. 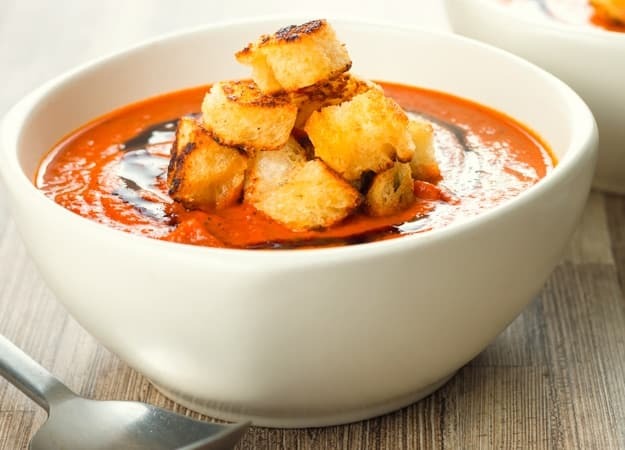 Tomato Soup brings back lots of good family memories for me. My mother would make tomato soup and grilled cheese sandwiches friday nights. 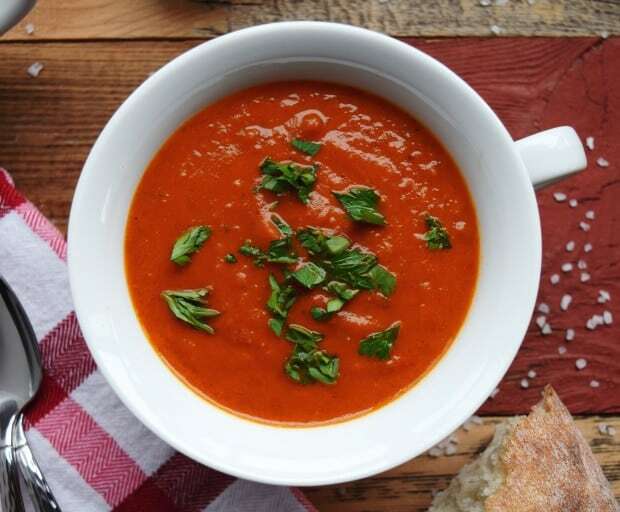 Thanks Brian for bringing this Tomato Soup to a new and delicious level. Garlicky and roasted tomatoes. Perfect. What a great name for a delicious soup. 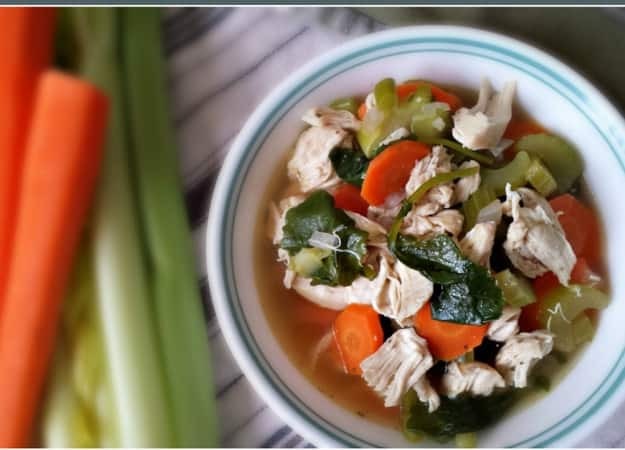 I love chicken soup and there is nothing better for warming you up, carrots, celery and broccoli the perfect combination. Tina, you are making me wish it snowed in Italy. Well even if it doesn’t this soup is delicious. I have to say I never liked chickpeas at all until about 3 or 4 years ago. I would always make this soup for my husband and my daughters who loved it, but not me. And then something came over me and I adore this soup and chickpeas. Who would have thought! I have to admit if I was to choose my favourite soup ever, hands down it would be French Onion Soup. Karen does an amazing job by making this soup. 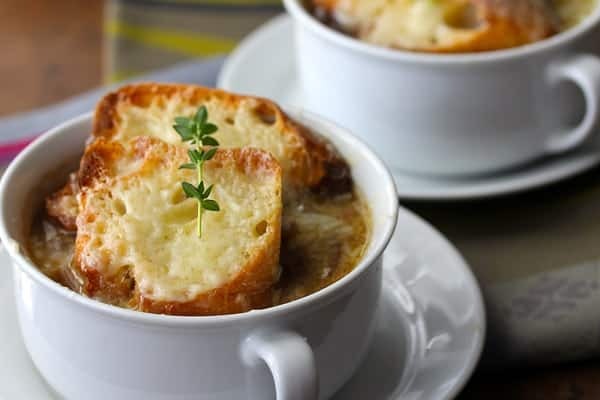 A soup that combines all my favourites, onions, melted cheese on a crunchy baguette, the perfect comfort foods. I love roasted veggies, especially peppers and combined with tomatoes, it’s gotta be good. So personally I think Byron got this soup exactly delicious. Serve it with some crusty bread and you’ll have comfort food at its best. 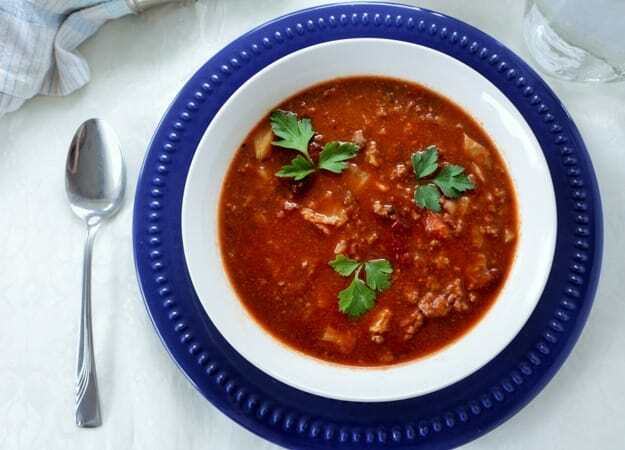 This a wonderfully hearty soup, full of ground beef, cabbage and kidney beans in a tasty tomato sauce. Easy to assemble and as Diane says low-fat and low carb, can’t get much better than that. 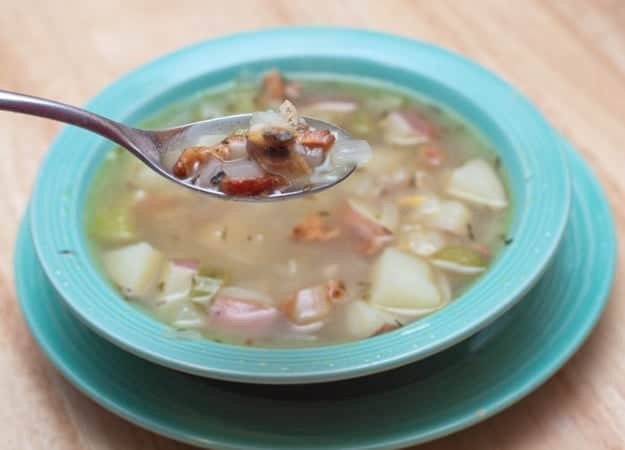 I bet you have heard of New England Clam Chowder and Manhattan Clam Chowder, well now Tracy has brought us an amazing alternative, Rhode Island Clam Chowder, no cream, no tomatoes but a clear broth mix filled with bacon, onions, celery, potatoes and of course clams. Tasty. What can be better than easy, quick, delicious and healthy? 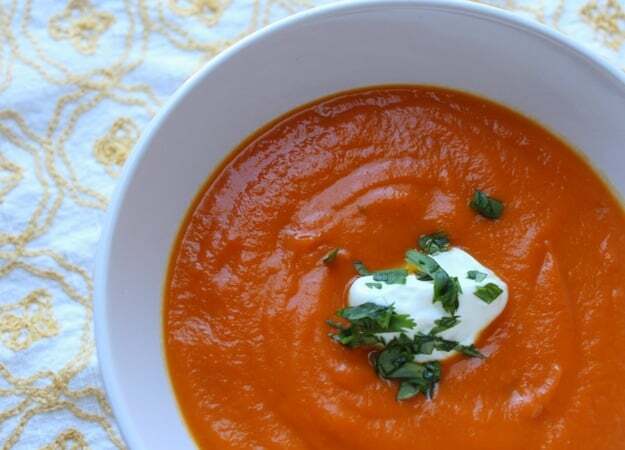 Not too much because this tasty soup made by Chrissie is a wonderful Fall Comfort soup. Tortilla strips in a soup? 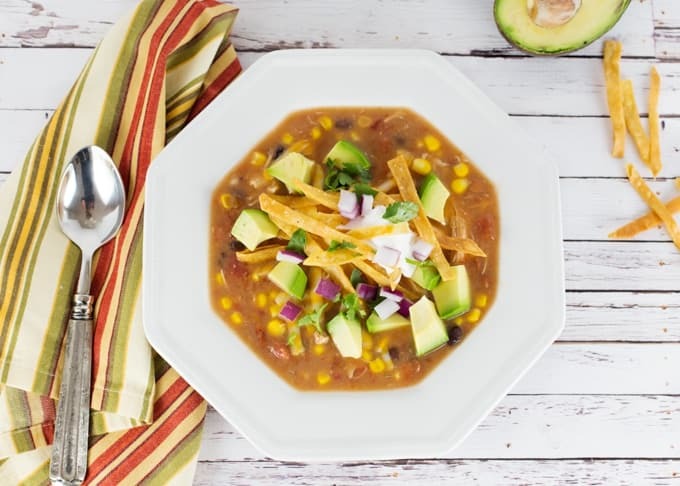 Why not, Renee has made a delicious soup that will warm anyone up, made with re-fried beans, black beans, corn and chicken, and topped with tortilla strips, now go grab a spoon. If you are looking for a creamy, tasty soup that will warm you up, this spicy pumpkin soup will do it, thanks to Linda’s amazing recipe! 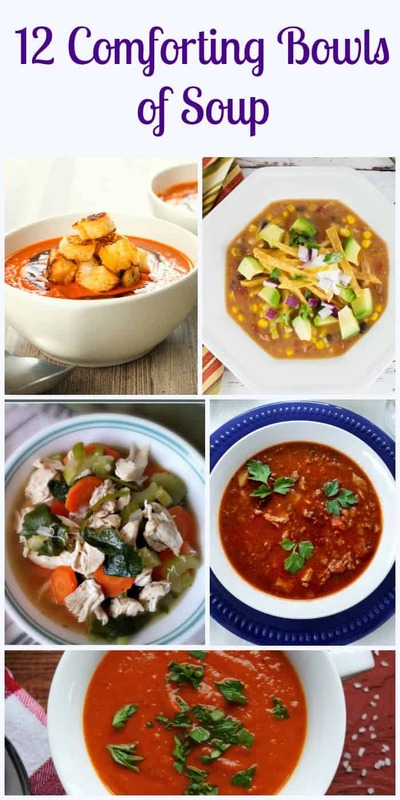 I hope you enjoy and decide to try these wonderful 12 Comforting Bowls of Soup from these amazing Food Bloggers. Every one of these soups will bring you comfort, I am sure. Buon Appetito! Thank you for bringing all these great soup recipes to this humble soup lover ☺ I bumped into Karen’s onion soup a while ago and it quickly became a favourite in our house, as well your creamy mushroom soup. Will have to try all of these lovely recipes this winter. Hi Jelena, thanks, I totally understand, I love soup too and plan on trying them myself. Thanks for this post, Rosemary. 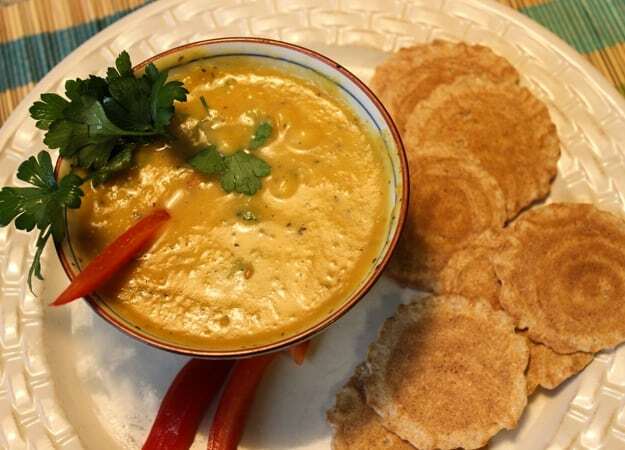 The weather here in northern Indiana is starting to be very chilly—perfect for soups! In fact in the last couple of days I’ve been digging out all my soup recipes. I will add these twelve to my soup recipes, so I can try them all! Thanks again—your blog is amazing! Great post Rosemary. Those soups look so warm and comforting. Thanks for including my Spicy Cajun Pumpkin Soup. OMG. Twelve bowls of heaven. I hesitate to open your e-mails because I’m always craving what’s in them. Thanks for taking the time to post these. Hi Ann, thanks I am sure you will enjoy all of them. So glad you enjoy the recipes. Hi Tina, thank you! Your soup sounds wonderful, can’t wait to try it!